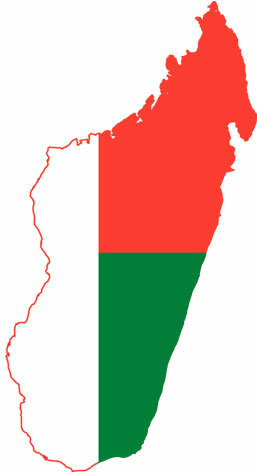 While neither the Southern African Development Community (SADC) and the host country for Ravalomanana, South Africa, were aware of Ravalomanana’s planned return, SADC has called for calm, political tolerance and national reconciliation in Madagascar as a prerequisite for political and security stability and socio-economic reconstruction. SADC has expressed sadness at the arrest of former President Marc Ravalomanana after his return to Madagascar. “The SADC region is saddened by the unfolding political situation in the Republic of Madagascar stemming from the return to the country by former President Marc Ravalomanana and his subsequent detention,” said Chairperson of the SADC Organ on Politics, Defence and Security, President Jacob Zuma, in a statement on 16 October 2014. President Zuma said SADC and the international community had been seized with the political crisis in Madagascar since 2009. SADC, the African Union and other key international players under the umbrella of the International Contact Group launched concerted efforts towards the restoration of constitutional normalcy in Madagascar. Mediation efforts spearheaded by SADC led to the signing of a Road Map in September 2011. Under the watchful eye of SADC, in collaboration with the international community, Madagascar held elections as outlined in the Road Map. As a culmination of this process, the newly democratically elected President of Madagascar, Henry Rajaonarimampianina, was sworn in on 25 January 2014. “In pursuit of sustainable political and security stability in the Republic of Madagascar, Article 20 of the SADC Road Map on Madagascar provides for the unconditional return of political exiles, including Marc Ravalomanana, the application of Amnesty Law and national reconciliation,” said SADC. The reconvening of Lesotho's Parliament by King Letsie III, came against the framework of the recently signed Maseru Facilitation Declaration on 2 October 2014 facilitated by Deputy President Cyril Ramaphosa and signed by all Lesotho's political parties. SADC facilitator and South African Deputy President, Cyril Ramaphosa, attended the opening of Lesotho Parliament on 17 October 2014, reconvened by King Letsie III. In terms of the Maseru Facilitation Declaration, King Letsie III had to reconvene Parliament on 17 October 2014 to discuss the budget and all other related matters regarding the holding of elections. The declaration further provided that Parliament was to be dissolved at the beginning of December 2014 to prepare for the holding of the national general elections scheduled for the end of February 2015 and on a date to be set by King Letsie III. Government will implement ocean economy projects which are expected to contribute more than R20 billion to the gross domestic product (GDP) by 2019. 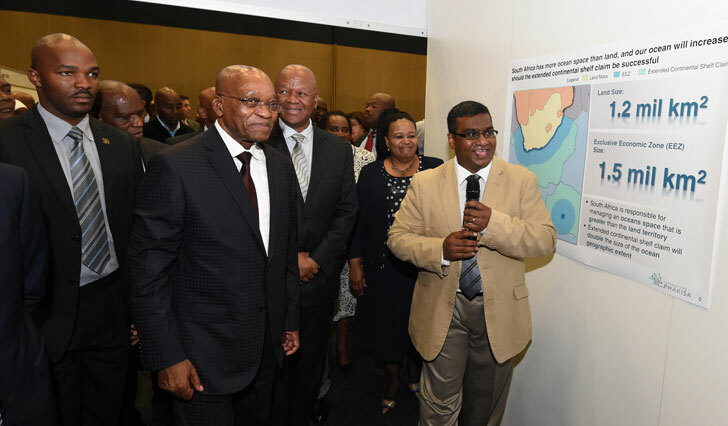 This is according to President Jacob Zuma, who released results of weeks of exploratory work of unlocking the country’s ocean economy during the open day of Operation Phakisa on 15 October 2014 in Durban. President Zuma said the oceans had the potential to contribute up to R177 billion to the GDP and create just over one million jobs by 2033. Four priority areas have been identified which include marine transport and manufacturing, offshore oil and gas exploration, aquaculture as well as marine protection services and ocean governance. The work stream on offshore oil and gas exploration has set a target of drilling 30 exploration wells in the next 10 years. “Over the next 20 years, this work could lead to the production of 370 000 barrels of oil and gas per day. 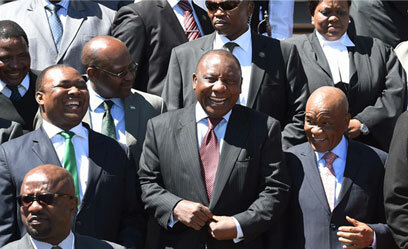 The result would be 130 000 jobs and a contribution of US $2.2 billion to GDP,” said President Zuma. South Africa’s coast and adjoining waters have possible resources of approximately nine billion barrels of oil. The aquaculture work stream underlined the high-growth potential of South Africa’s aquaculture sector due to an increasing demand for fish. Eight initiatives that could spur growth in the sector have been identified. One of the initiatives includes implementing 24 projects across South Africa, which are expected to grow the aquaculture sector’s revenue from about R500 million today, to almost R1,4 billion in 2019. President Zuma said the marine protection services and ocean governance work stream had undertaken the task of developing an overarching, integrated ocean governance framework for the sustainable growth of the ocean economy. Operation Phakisa promotes economic growth and job creation in line with the goals outlined in the National Development Plan. The operation is an adaptation of the Big Fast Results methodology that was successfully applied by the Malaysian Government in the delivery of its economic and government transformation programmes. Botswana held its first multiparty elections in 1965 ahead of the declaration of independence. 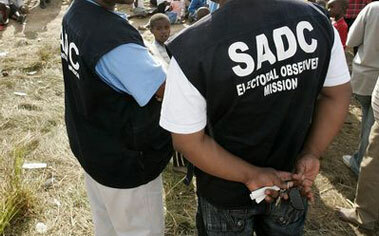 More than 70 observers will be deployed by the Southern African Development Community (SADC) Electoral Observer Mission (SEOM) to assess the October 24 general elections in Botswana. “In Botswana, our oldest democracy in SADC, we will be able to observe practices honed and developed over decades of democracy. SADC will deploy more than 70 observers across the various districts,” said International Relations and Cooperation Minister, Maite Nkoana-Mashabane. The Minister is heading the SEOM and made the announcement in Gaborone on 17 October at the official lauch of the SEOM to Botswana. “We would like to congratulate Botswana on its track record to date and its valued contribution to building democratic institutions in the region. We trust that the elections on 24 October 2014 will continue to build on this proud tradition,” she said. The SEOM is expected to consider the general conduct of the elections guided by the principles of full participation of citizens in the political process; freedom of association; political tolerance; equal opportunity for all political parties to access the state media; equal opportunity to exercise the right to vote and be voted for; and an acceptance and respect by political parties of the results after the elections have been proclaimed as free and fair by the electoral authorities in accordance with the law. 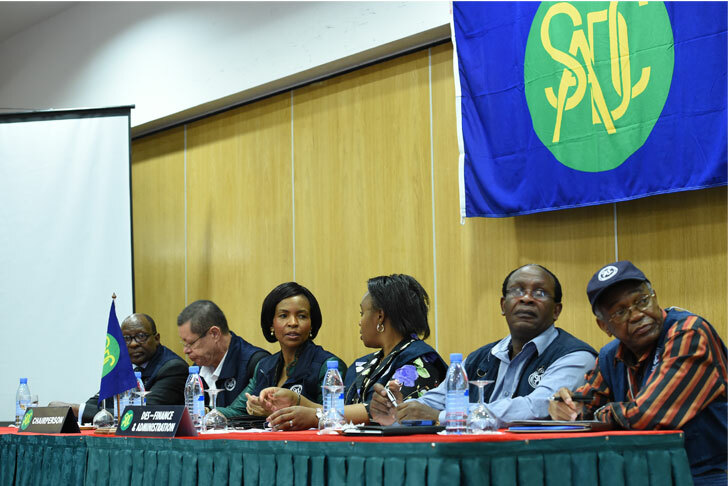 The Southern African Development Community (SADC) Election Observer Mission (SEOM) issued its preliminary statement on 17 October 2014, following the 2014 elections in Mozambique. 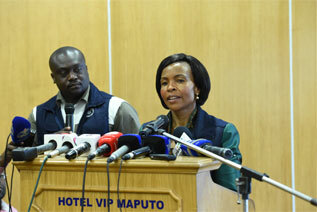 “Based on its observations, the SEOM concludes that the 2014 presidential, legislative and provincial assemblies elections in the Republic were generally peaceful, transparent, free and fair, and credible, thus, reflecting the will of the people of Mozambique in accordance with the National Electoral Laws and the SADC Principles and Guidelines Governing Democratic Elections,” said International Relations and Cooperation Minister, Maite Nkoana-Mashabane. The Minister led the SADC SEOM to Mozambique on behalf of President Jacob Zuma, Chairperson of the SADC Organ on Politics, Defence and Security Cooperation. “The SEOM would like to take this opportunity to commend the CNE for managing the electoral process in a transparent and professional manner. There are some best practices which the SEOM noted during the electoral process. In particular, the SEOM congratulates the Republic of Mozambique for providing funding to political parties, as a means of enhancing democratic practices. A total of 11 countries presented their credentials to the President. 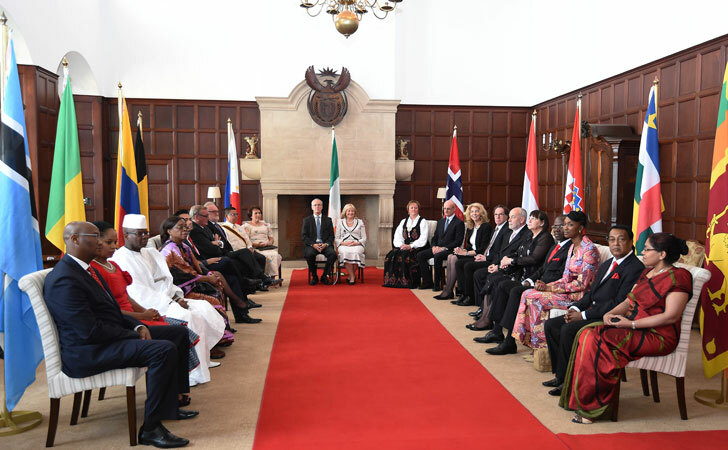 President Jacob Zuma received Letters of Credence from ambassadors and high commissioners-designate at a credentials ceremony at the Sefako M Makgatho Presidential Guest House in Pretoria on 16 October 2014. The diplomats were representatives from the Republic of Colombia, Republic of Croatia, Republic of Ireland, Republic of Mali, Republic of Botswana, Republic of Sri Lanka, Republic of Philippines, the Kingdom of Belgium, Kingdom of the Netherlands, Kingdom of Norway and the Central African Republic. Speaking at the event, President Zuma said that in just 20 years, South Africa had broadened its international reach from 34 missions abroad in 1994, to a staggering 126 missions throughout the world. He said the country had a proud international relations tradition with a sharp focus on Africa. “We have been consistently vocal in our belief that the struggle for a better South Africa is inextricably linked to the struggle for a better Africa." He said South Africa remained grateful to all countries and people that stood on the side of justice, freedom, human rights and equality during the dark days of apartheid colonialism. President Zuma said South Africa gained its democratic victory through the struggles of South Africans and freedom-loving people across Africa and the world. 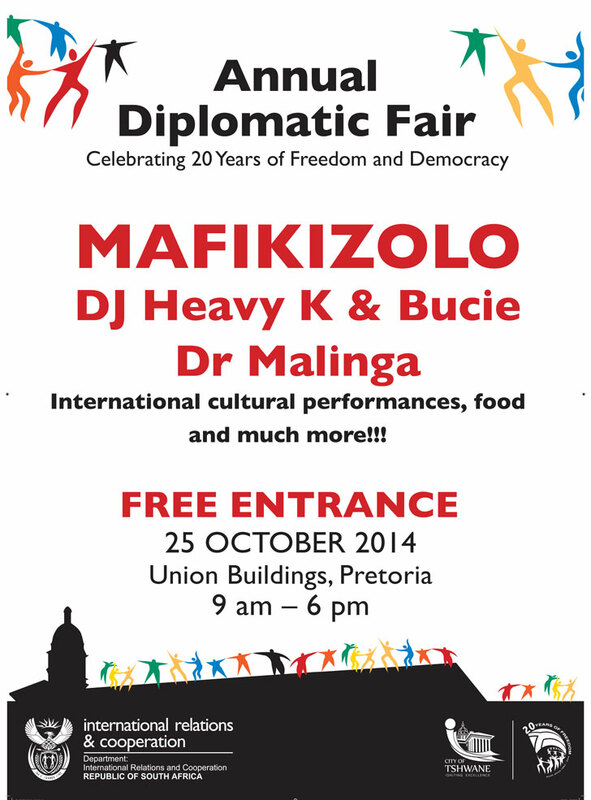 Diplomatic relations with Mexico were established in 1993 and the South African Embassy opened in Mexico City in 1994. Since then, Mexico has become one of South Africa’s top three trade partners in Latin America and the Caribbean, while South Africa is Mexico’s largest trade partner in Africa and largest African investor in Mexico. 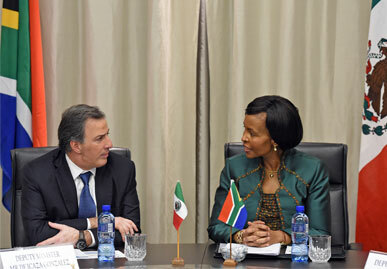 International Relations and Cooperation Minister, Maite Nkoana-Mashabane, received her Mexican counterpart, Dr José Antonio Meade Kuribreña, Minister of Foreign Affairs of Mexico, on 17 October 2014 for the Second Bi-National Commission (BNC). In 2010, the first BNC was held in Mexico. At the BNC, the former Mexican Foreign Minister and Minister Nkoana-Mashabane signed a Joint Statement establishing a priority relationship. Between 2010 and 2014, more government departments and agencies established relations and six agreements covering different areas of cooperation were signed. Speaking at a press conference at the conclusion of the BNC, Minister Nkoana-Mashabane said the meeting allowed the two countries to reflect on the portfolio of relations and projects of cooperation. “Today, more than 20 government departments and agencies have bilateral relations and contact with Mexico or are in the process of establishing such relations,” the Minister said. She said the agreements signed, including the “Action Plan: South Africa and Mexico towards a Priority Relationship”, were in line with the New Growth Path priorities, as supported by the National Development Plan, and included job creation, energy, agriculture, mining, manufacturing and tourism. The BPS incentive aims to attract investment and create employment in South Africa through offshoring activities. These incentive grants are calculated on the number of projected offshore jobs to be created based on a tapering scale and is awarded on actual offshore jobs created. South Africa’s Minister of Trade and Industry, Rob Davies, last week launched the revised BPS at South Africa House in London, United Kingdom (UK). "The revised Business Process Services incentive scheme will build upon the success of the previous scheme, which led to the creation of 9 077 jobs on the back of financial disbursements of R587 million," said Minister Davies. The revised incentive will further support the South African Value Proposition, which has seen South Africa named as the Best Offshoring Destination 2012 by the UK's National Outsourcing Association (NOA). 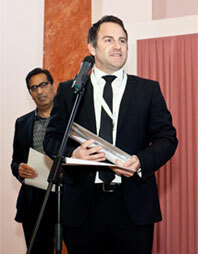 This was followed by an award from the European Outsourcing Association in 2013. In 2014, it received an award for its Skills Development Programme at the NOA Outsourcing Professional Awards. Trade, investment and skills development form the backbone of relations between South Africa and the Republic of Korea, a high-technology country which makes it an attractive partner for South Africa. The Deputy Minister of International Relations and Cooperation, Nomaindiya Mfeketo, co-chaired the Eighth Policy Consultative Forum together with LEE Kyung-soo, Deputy Minister for Political Affairs of the Republic of Korea (ROK), on 17 October 2014, in Seoul, Korea. During the Policy Consultative Forum, Deputy Minister Mfeketo conveyed the priorities of the Government of South Africa as outlined in the National Development Plan (NDP), South Africa’s road map to eliminate poverty and reduce inequality by 2030. The NDP also provides a strong platform for collaboration and partnership to address constraints to growth, create jobs and achieve a more inclusive society. South Africa and the ROK share similar views on the importance of multilateralism. The Republic of Korea provides ongoing support for the continued development of the African continent through the Korea-Africa Forum. The previous forum was held on 17 October 2012. The next Korea-Africa Forum is scheduled for 2015. Korea is South Africa's fourth-largest trading partner in Asia and South Africa is Korea’s largest trading partner in Africa. 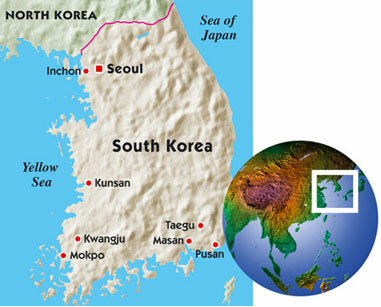 Korea enjoyed a favourable trade balance with South Africa in 2013 – approximately R6,1 billion. Total trade in 2013 was R30,2 billion, with South African exports to Korea in the region of R12,1, and South African imports from Korea in the region of R18,1 billion. 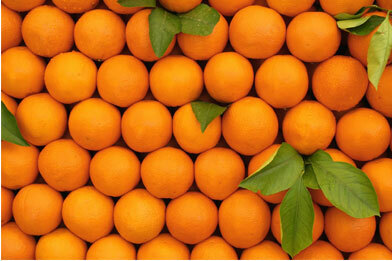 The South African citrus industry exports around 100 million cartons to 45 countries, which generates R6 billion of foreign exchange; but 45% of that total goes to the EU. South Africa has raised the issue of the European Union’s (EU) regulations on Citrus Black Spot at the Sanitary and Phytosanitary Committee of the World Trade Organisation (WTO), says the Department of Trade and Industry (the dti). This as the EU has threatened to refuse entry to citrus fruit exports from South Africa, alleging that the fruits found with traces of black spot on peels pose a risk to the EU citrus producers. “The Minister of Trade and Industry, Dr Rob Davies, has expressed the view that the EU stance is fundamentally driven by protectionist, rather than plant health concerns and is aimed at restricting highly competitive citrus imports from South Africa to the benefit of citrus producers in the EU,” dti spokesperson Sidwell Medupe said on 16 October 2016. Minister Davies has said that there is no scientific consensus that supports the EU’s claim that Citrus Black Spot found on peels could infect European orchards. He has also pointed out that proposals from South Africa to divide the EU into different zones with stricter regulations for imports into citrus- growing areas in southern Europe had been ignored. The committee further applauded the country on its Constitution and legislative provisions for children, which it said continue to provide guidance for the African continent. 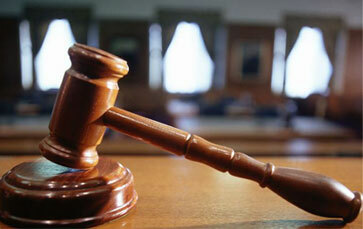 The AU has lauded South Africa for establishing its sexual offences courts, the first of its kind in Africa. This comes after South Africa recently presented its periodic report to the ACERWC in Addis Abba, Ethiopia. The committee was conducting its periodic evaluation of the Country Reports on Rights and Welfare of the African Child in line with the African Charter on the Rights and Welfare of the Child, to which South Africa is a signatory. “The African Committee of Experts on the Rights and Welfare of the Child (ACERWC) – an expert committee of the AU, has congratulated South Africa for leading in the establishment of sexual offences courts …,” said Department of Social Development representative, Lumka Oliphant. The Department of Trade and Industry (the dti) is supporting 51 companies to participate in the South Africa-China Expos in a variety of sectors, including agroprocessing, chemicals, plastics, steel and aluminium, among others. South African companies are showcasing their products at the South Africa-China Expos, which kicked off this week in Hong Kong, Shenzhen, Chengdu, Shanghai and Beijing. The aim of the Expos, running from 20 to 31 October, is to ensure that trade and investment between South Africa and China is increased. Antoinette Vermooten, CEO of Bayede, a wine company that is participating in the Expos, said their main objective of going to China was to expand the company's footprint in the Asian country and to get new importers and trading partners. She said her company, which participated in the 2013 South African Expos in China, managed to record sales to the total value of R5,2 million as a result of their participation in the expos and was optimistic that this year they would double the numbers. The Director of Robinson and Sinclair Wine Company, Tanja Robinson, who is also part of the delegation, said after their previous participation in the Expos in China, her company was now exporting its premium wines to the value of R10 million per annum to Xiamen. She said this year she would like to meet specialised wine importers and large corporates and continue to expand their footprint in China. One of the South African products that will be showcased at the expos is rooibos tea. Founder and managing member of Blue Africa Trading, which specialises in rooibos tea, Charl Rudman, said he would like to establish contacts with companies that would be interested in importing rooibos tea products from South Africa. According to the Minister of Trade and Industry, Dr Rob Davies, the objective of the ITI to Brazil is to increase the exports of South African value-added products to the Brazilian market. The Group Chief Operations Officer of the Department of Trade and Industry (the dti), Jody Scholtz, is leading a business delegation comprising of 29 companies on the Sixth Investment and Trade Initiative (ITI) to Brazil from 20 to 24 October 2014. The ITI is taking place in the cities of São Paulo, Belo Horizonte, Curitiba, Joinville and Porto Alegre. "The ITI will focus on showcasing South Africa's capabilities to produce world-class products and services in the targeted sectors of capital mining equipment, agroprocessing (wine, fruit juices and rooibos tea), cosmetics and aerospace and defence," says Minister Davies. The ITI programme includes a trade and investment seminar, business-to-business meetings and sector-focused site visits to various companies in the four cities. Brazil remains South Africa's largest trading partner in Latin America. Trade between South African and Brazil, who are both members of the BRICS (Brazil, Russia, India, China, and South Africa) and IBSA (India-Brazil-South Africa) groupings, has seen steady growth in recent years. Exports to Brazil still represent a small percentage of South Africa’s global exports. South Africa's top five exports to Brazil include anthracite (coal), precious metals, plastics, aluminium and car engines. The top five imports from Brazil include vehicles, machinery and ore. This year’s workshop was held under the theme: “Strengthening Regional Cooperation and Resilience in Water-Related Disasters”. The Southern African Development Community (SADC) Secretariat held the Sixth SADC River Basin Organisation workshop in South Africa. The workshop was facilitated by the Global Water Partnership-South Africa (GWP-SA). This series of workshops was meant to build consensus on SADC’s strategic approach to support the efforts of member states with regard to the establishment, institutional development and strengthening of RBOs, as well as other trans-boundary water resources development and management mechanisms in the region. This initiative is meant to enhance coordination among relevant institutions as well as optimising the readiness of the river basins organisations with regard to floods and other climate change impacts. The SADC region takes pride in that it is recognised internationally as a role model for trans-boundary water resources cooperation. The summit will be held under the theme “Shaping the Future of Africa with the People: Africa Local Government Contribution to the Africa 2063 Vision”. 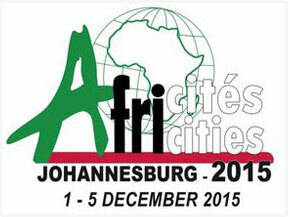 The Minister of Cooperative Governance and Traditional Affairs, Pravin Gordhan, says the forthcoming Africities Summit, to be hosted by the City of Johannesburg next year in December, will stimulate the local economy. “We are confident that the summit will stimulate local economic activities, especially tourism, as we had witnessed with the 2010 World Cup,” he said. The summit, held every three years, looks at issues affecting urban and economic development in African cities and finds ways to share knowledge and experiences. The programme is part of the commitment and continued effort by the Government and the Ministry of Higher Education and Training through international cooperation and partnerships of ensuring that students from the country are sent abroad to study and come back to make a meaningful contribution to the economy. 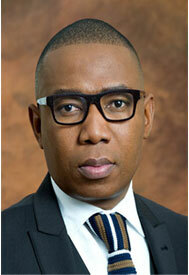 The Deputy Minister of Higher Education and Training, Mduduzi Manana, recently bid farewell to nine recipients of the Russian Government Scholarship. The students will pursue undergraduate and postgraduate degrees in the fields of Medical Biochemistry, Nuclear Physics, Chemical Technology and Applied Informatics in various universities in the Russian Federation. Adrian Saville, Chief Investment Officer of Cannon Asset Managers and GIBS visiting professor, has won the 2014 CEEMAN Champions Teaching Award, which recognises outstanding achievement by an individual faculty member.